AN EMAIL ARRIVES from Vital Arts, a charity associated with Barts hospital and the London NHS Trust. They commission music and art for hospitals to act as a form of complementary medicine and they’re looking for sound artists to get involved with a new project. Not being a sound artist and having no experience of installations there’s not a lot I can contribute to this. But anyone with the experience and sense of responsibility needed for such work might want to get in touch with Vital Arts through their website. Healing sounds are more commonly relegated to the modest therapeutic goals of relaxation CDs or the drippy Enya-type music sometimes laid on by non-NHS dentists. I got that and liquid Temazepam to drink when I last had a wisdom tooth pulled out. The effects of both music and drug went together eerily well. Last week some newspapers reported the revival of a much older and non-Western tradition of medicinal music. 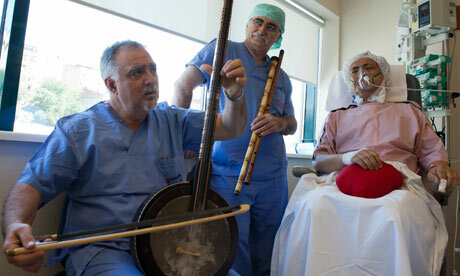 The Metro carried a story about two doctors at Istanbul’s Memorial hospital using classical Turkish and Arabic music originally composed to help sick people get better. U? ?ak Makam: effective in the treatment of foot pain and insomnia. It’s a nice exception to Betrand Russell’s claim that, in the absence of modern medical knowledge, people always default to doing unpleasant things to the sick and the mad.